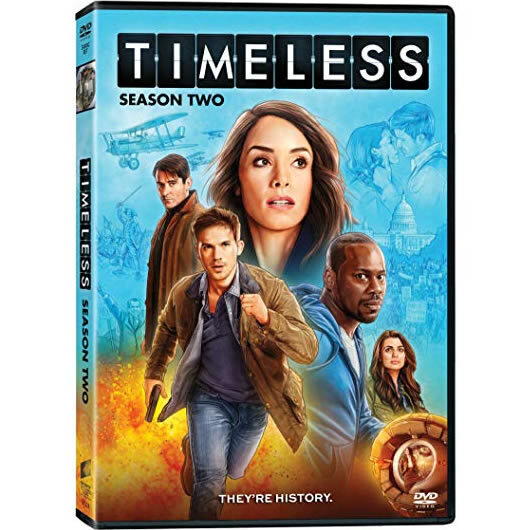 Season Two of TIMELESS picks up with our beloved team racing through history to prevent the destruction of the world as we all know it. This season, they find an unlikely ally in their quest to ruin Rittenhouse, a deadly organization with plans to change history and reshape reality. Still making every effort not to affect the past themselves, they will visit 1692, 1941, 1981 and more as they are introduced to the likes of Marie Curie, William Randolph Hearst, a young JFK and a multitude of other influential people throughout history. Race throughout history with our beloved team – Rufus (Malcolm Barrett), a scientist; Wyatt (Matt Lanter), a soldier; and Lucy (Abigail Spencer), a history professor – in an attempt to prevent the destruction of the world as we all know it. Making every effort not to affect the past themselves, they will visit the years 1692, 1917, 1941, 1981 and more. We’ll be introduced to the likes of Marie Curie, Hedy Lamarr, William Randolph Hearst and a multitude of other influential people throughout history. When a Rittenhouse sleeper agent in 1941 Hollywood steals the only copy of “Citizen Kane,” Lucy, Wyatt and Rufus team up with Hedy Lamarr to get it back. Hedy Lamarr turns out to be not only a glamorous movie star but also a scientific wizard whose discoveries led to the invention of WiFi. The Mothership jumps to South Carolina in 1863, where the Time Team partners up with a courageous Union spy and military leader, Harriet Tubman, to thwart Rittenhouse’s plan to alter the outcome of the Civil War. The Season 2 finale: When Jiya makes a daring escape from Rittenhouse that strands her in San Francisco’s Chinatown in 1888, the fractured Time Team goes back to save her. This show is not only educational and surprisingly historically accurate, but it’s highly entertaining and combines a little bit of everything in each episode: action/adventure, comedy, drama, and even a little romance. This show highlights diversity in its cast and the featured historical figures. It appeals to viewers young and old alike. It is one of my favorite shows to watch. My whole family watches this show and loves it very dearly I am a history major and I LOVE how timeless has gotten my whole family just as interested as I am. Picture quality is terrific only wish it was on Blu-ray because I would buy it again Timeless is amazing! I’ve always been obsessed with time travel, but this show gives you so much more. You become invested in people from history- they’re humanized, they come to life, you learn what they were fighting so passionately for. The actors do a spectacular job of taking the viewers on a ride through history. After a dramatic reprieve from cancellation, TIMELESS has returned with smart scripts, great design and a first rate cast that make last years ‘fan favorite’ one of the best shows of 2018. After viewing the first three episodes it’s apparent that the show’s creators, Eric Kripke and Shawn Ryan, treated each as if it was a film, resulting in a high quality product (similar to the best of HBO) that deserves a second watch. Ix really liked this series but it never seemed to catch an audience. And it left us with a cliff hanger that for the sake of its fans needs to be resolved. They are a group of time travelers trying to saving history from a group that wants to change history to fit their evil(???) plans. Give it a watch and hope for aTV movie to resolve some issues.